The 2018 Toyota RAV4 is one of the most popular and best-selling models of Toyota. In fact, it’s even popular when it is compared with their most direct competitors like Mercedes-Benz, Ford, BMW, Audi, and Honda. There are three things that clearly make the 2018 Toyota RAV4 different from the competition – the off-road performance, the styling, and the fuel economy. So, if you’re a bit like us, you just can’t wait to find out what the 2018 Toyota RAV4 is ringing us. So, let’s take a look. One of the things that most people are looking forward to seeing in the new 2018 Toyota RAV4 is the exterior. The first thing you will notice is that the 2018 Toyota RAV4 is 9 inches bigger. Plus, you will notice a lot of changes in the front. From a brand new grille, headlamps, and even new bumpers. Since the 2018 Toyota RAV4 is 9 inches bigger, this means there’s more space within the cabin, meaning more comfort as well. But the 2018 Toyota RAV4 is also taller. The 2018 Toyota RAV4 should come with three trim levels – the standard, the XLE, and the Limited. The 2018 Toyota RAV4 XLE is the intermediate trim level and it comes with a lot of features. These include 17-inch alloy wheels, sunroof, rearview camera, dual-zone climate control, and a 4.2 inches infotainment system which were already present on the current version but should include more. The current Toyota RAV4 Limited model has keyless entry system, power driver seat, 18-inch chrome plated rims, power liftgate, LED headlights, and a premium audio system with integrated navigation. We believe there shouldn’t be any changes in the equipment of the 2018 Toyota RAV4 Limited. In terms of safety features, you can count with the inclusion of the Toyota Safety Sense-Pre Collision System, pedestrian detection, trailer sway control, departure warning, steering assistance, hill start assist control, and adaptive cruise control. Under the hood, we are expecting to see two different engines on the new 2018 Toyota RAV4. The first one should be a 2.5-liter 4-cylinder engine that is capable of producing 176 of horsepower and 172 of torque. The second one should be an engine that has been developed in conjunction with BMW. It’s the 1.5-liter 4 cylinder engine. In what concerns with the transmission, the one used should be a 6-speed automatic gearbox. 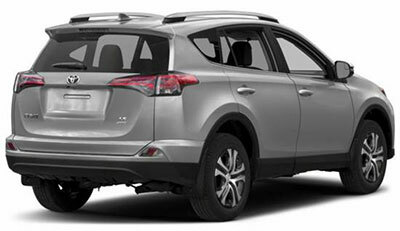 We have been hearing and seeing a lot of rumors regarding a 2018 Toyota RAV4 Hybrid version. Although we are not sure if Toyota is going this way, in case they go, the most probable engine you’re going to find under the hood is the 2.5-liter 194 BHP hybrid system, the same one used on Prius. If this is the case, the transmission should also be different. Toyota should go for a CVT style transmission. We are expecting to see the first 2018 Toyota RAV4 units arriving in dealer showrooms in September. In what relates to the price of the new 2018 Toyota RAV4, it’s all about speculation at the moment. Even though we believe the starting price of the new 2018 Toyota RAV4 should be around the $25,000, most rumors are pointing to $30,000. Make sure to check out all the news related to the new Toyota models coming out.